The FlashPro allows full user tuning and datalogging for your 2016+ US Civic 1.5 Turbo. It includes Windows based software called FlashProManager. The FlashPro connects from your laptop's USB port to your vehicles OBD2 diagnostic port to provide live tuning with a variety of calibrations, extensive real time and stored datalogging capabilities. Warning: Within the USA this product is legal only for racing vehicles which may never be used upon a public highway. Ignition, fuel, idle speed table editing. The FlashPro Manager software comes with several built in calibrations for different intakes and boost levels. You will find a base maps that is a great fit for your car. 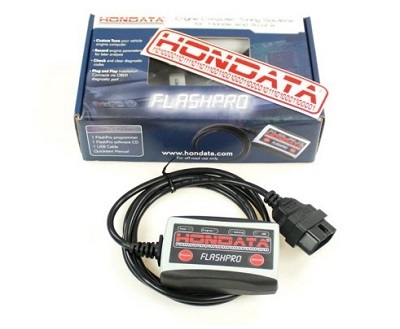 The Hondata FlashPro is a product that delivers all the features you need, now, fully working, that will grow with you as you upgrade your engine. With live tuning capabilities, your tuner can now tune your car faster and more accurately. Listed below are dyno plots of several of the many base maps provided with the FlashPro. How the FlashPro will perform on a stock Civic 1.5 Turbo? The answer is superbly! These are examples of the base maps provided with the FlashPro. The lower curves are done with the specified 87 octane on a stock 1.5 turbo Civic. The higher power curves are with California 91 octane and the FlashPro base maps. With higher octane fuel and more boost, extra power and torque is easily achived. Maps for cold air and short ram intakes are also included. Civic CVT high octane plus 3 psi more boost. Civic CVT high octane plus 6 psi more boost. Civic MT high octane plus 7 psi more boost.